Every year, dieting and losing weight tops Americans’ list of New Year’s resolutions. The revelry of the holidays — and all of the fattening delicacies it brings with it — combined with the pitfalls of the typical low carb diet, usually leave people feeling and looking heavier this time of year. And yet, the New Year’s resolution diet quickly becomes a viscous circle — a revolving door weight loss and weight gain. By this time next year, you’ll most likely be the same weight or even heavier, and the only thing you’ll have to show for it is a few months of starving yourself. Time to turn your New Year’s resolution into a diet revolution. The “Diet Revolution” was the term coined by Dr. Atkins, the nutritionalist who first popularized the low carb diet back in the 1960s. He wrote several books about his Diet Revolution, and revealed that the big problem in Americans’ diets is not fat or calories, but rather carbs and sugar. He argued that modern man’s diet has shifted from a high-protein diet to a high-carbohydrate diet, and that our metabolisms are not capable of handling all of the extra carbs and sugar we consume. Thus, the only way to get back to a healthy weight is to switch from a modern high-carb diet to a more primal low carb diet. There is something inescapingly funny about the term “meat stick.” Lewd notions aside, there is something primal about the idea of “meat on a stick,” as it conjures up early man gnawing a fire-charred leg ‘o beast. Interestingly enough, primal diets — which are essentially Atkins-esque — are becoming evermore popular, and as a result, these new “primal dieters” are in search of new, tasty ways to get their meat on. First up is the Sci-Fit Fat Free Beef Stix, which essentially offers a higher-quality alternative to the Slim Jim. The Sci-Fit Fat Free Beef Stix come in both Teriyaki and Black Pepper varieties, are truly fat free and low carb — each stick is just 1 gram of carbs. In addition, the ingredients list thankfully doesn’t include any MSG, a common ingredient in Slim Jims and other mass produced meat sticks. Ostrim also makes a nice Natural Beef Snack as well. Theirs is a high-protein meat stick that are very low in fat and USDA inspected, guaranteeing a true and correct nutritional profile of quality and wholesomeness. Their ingredients are very readable, including just Beef, Water, Sea Salt, Corn Starch, Natural Spices, Turbinado Sugar, Dehydrated Garlic, Natural Flavorings (Celery Powder), and Lactic Acid Starter Culture. 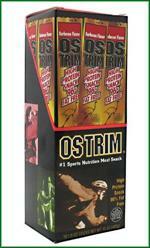 Ostrim offers several great flavors, such as its original flavor, spicy pepper, and teriyaki. If you want to take a walk on the wild side and try a meat stick that is not beef, then how about ostrich? Ostrim Meat Sticks are incredible great-tasting ostrich meat sticks, and offer the same level of nutrition and low carb snacking goodness. The Ostrim MEat Sticks comes in a variety of great flavors as well, such as barbeque, natural, pepper, and teriyaki. Ready to order some of these tasty beef and meat sticks for a low carb snack? Linda’s Diet Delites carry all of them! 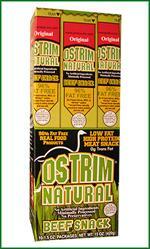 Take a look at the Sci-Fit Fat Free Beef Stix, Ostrim Natural Beef Snack, and Ostrim Meat Sticks today! If you peek around the pudding and Jello section of your supermarket, you’re bound to notice that a vast majority of pudding and Jello snacks on the market today are sugar free. That being said, none of them are really tailored for low carb or gluten free dieters — they are really designed for low calories dieters. If you are looking for pudding or gelatin that is custom-tailored for low carb or gluten free diets, then you’ve come to the right place. We recently added two new dessert products at Linda’s Diet Delites: MHP Power Pak Pudding and Pure Protein Gelatin Protein Snack. Once you get past all of the Ps in those two product names, you begin to recognize how these two desserts make perfect snacks for even the strictest dieter. MHP Power Pak Pudding is a really interesting product, in that it offers a truly high-protein, low carb, low cal option. It has a whopping 30 grams of protein, only 190 calories and zero sugar. And because it tastes so good, Power Pak Pudding really is one of the most satisfying low carb healthy snacks that we’ve come across in a long while. It also has no sugar alcohols, which is nice. If you’re looking for a zanier low carb snack, we have the low carb solution to Jello. Pure Protein Gelatin Protein Snack is as fun and tasty as Jello, but with much better nutritionals for the low carb dieter. Pure Protein is unique is that it offers a lot of protein in a snack that you don’t usually associate with protein: 23 grams to be exact, plus only 1% DV of carbs for low carb lifestyles. The best part is that, in spite of having NO added sugar and NO aspartame, it still tastes great! 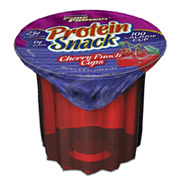 Pure Protein Gelatin Protein Snacks come in three packs, and are offered in two flavors: tropical punch and cherry. Pudding and Jello are two desserts that low carb dieters often assume have to be left off of the menu. But these two new products allow you to enjoy a satisfying snack without the guilt of breaking your low carb diet. Interested in purchasing these products? Linda’s Diet Delites carry them both! Be sure to check out Power Pak Pudding & Pure Protein Gelatin Protein Snack on our website now! Think that because you’re on a low carb or sugar free diet that your most favorite cookies are off limits? Think again! Take a look at these two new sugar free cookie varieties that are really familiar and tasty. When I was a kid I remember my first foray into tasting a diet cookie. Because my Mother suffered from hypoglycemia, she was basically on a sugar free diet back when the mainstream population knew about Atkins and low carb dieting. The cookies that she bought were devoid of taste and goodness — it was like eating a piece of particle board. In spite of the fact that low carb and sugar free foods have made tremendous strides over the past thirty years, many low carb and sugar free cookies on the market today still fail to deliver on anything that even approximates the taste and texture of a real cookie. Often times, what you get in its place is dense, brittle, and lacking in sweetness. Fortunately for the low carb dieter, some new sugar free cookies have come onto the market that have really revolutionized the sugar free cookie scene, and is bound to grab peoples’ attention. 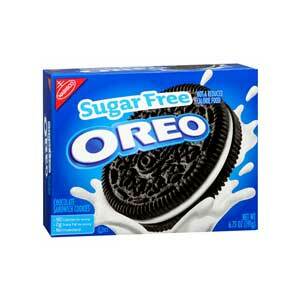 First up are the new sugar free Oreos. Yes, you are reading that correctly: Nabisco has jumped into the sugar free cookie scene with a sugar free version of perhaps the most iconic cookie in America. These Oreos are surprisingly close to the original, and they give you that same combination of dark chocolate cookie with cream filling — a perfect balance of “wet” and “dry” textures with an amazing taste. This is comfort dessert snacking at it best, and at just 6 grams of net carbs for two cookies, it can be a really satisfying treat after a meal. Plenty of low carb and sugar free food manufacturers have sought to replicate the Oreo, but none have done it as successfully as Nabisco itself. You really gotta try these! 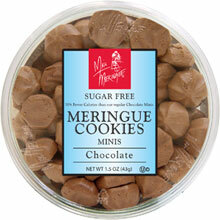 Of course, if you want to go in a completely opposite direction to the Oreo, there is also a new sugar free cookie brand to check out — Miss Meringue Sugar Free Mini Meringues. Meringue cookies have always been a good low carb and sugar free option for dieters, since they are essentially made mostly out of egg whites and air. Because of their airy texture, the sugar used is more suspended, meaning that the aftertaste effect is lessened when using articifical sweeteners. Miss Meringue Sugar Free Mini Meringues benefit from these facts, and these cookies offer a great sugar free cookie option. They come in both chocolate and vanilla, and a serving of 25 mini cookies are zero carbs! If you’re ready to get your cookie on, these two new sugar free cookies are the perfect choice. Thank you for reading our article! Ready to pick up some sugar free Oreos or Miss Meringue Sugar Free Mini Meringues? We’ve got ’em both at Linda’s Diet Delites. Take a look! Looking for gluten free bread? Three Bakers Gluten Free bread comes in just about every shape, style, and configuration you can imagine, offering a great taste and texture for the gluten free dieter. Three Bakers gluten free bread is a full product line that is designed to completely replace all of your bread needs, without sacrificing taste or texture. Their 20 oz. 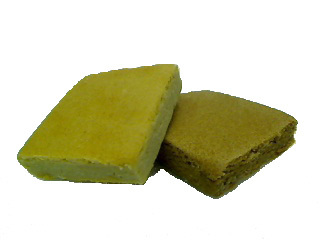 gluten free bread loaves are 100% all natural, and are an excellent source of fiber, with 5 grams per serving. They also contain no soy or dairy, (but they are made using eggs). Their three gluten free bread loaf varies come in white, whole grain rye, and perhaps one of the more interesting bread varieties that we’ve come across lately: “7 ancient grains.” To be sure, 5- and 7-grain bread has become popular over the years. But Three Bakers has taken the 7-grain approach to a new level, crafting it “from 7 ancient whole grains: Amaranth, Hemp, Quinoa, Teff, Sorghum, Flax & Millet.” Quinoa, in particular, is becoming increasingly popular in diet and nutrition circles for a variety of health benefits. Even better is that Three Bakers offers more than just gluten free bread loaves — they are also doing hot dog and hamburger buns and even hoagie rolls. If you are looking for a reliable gluten free bread line that can replace all of your bread needs without sacrificing on quality and taste, Three Bakers gluten free bread is definitely worth a try. Looking for Three Bakers gluten free breads online? We carry Three Bakers gluten free loaves, hot dog buns, hamburger buns, and hoagie rolls. Take a look at our complete selection and order today! Easy To Make CarLO CARBiano Low Carb Pizzas — Perfect For Lunch! Lunch can be a tricky meal n a low carb diet. Fortunately, CarLO CARBiano Low Carb Pizzas are a tasty, satisfying, easy, low carb solution for a quick lunch anytime! Last week, we outlined a solution for assembling an incredibly tasty low carb pizza in another blog article. If you love coming up with low carb solutions to typically high carb dishes, then you should find it reassuring to know that all of the ingredients needed to make a tasty low carb pizza are available on the market today. But what if you cannot be bothered to prepare a low carb pizza from scratch? That’s where CarLO CARBiano Low Carb Pizzas come in. While CarLO CARBiano makes a variety of tasty Low Carb Pizza crusts, they also make ready-to-eat low carb frozen pizzas as well. And like their crusts, they offer three wonderful varieties: four cheese, pepperoni, and Mexican style. In spite of the fact that CarLO CARBiano Low Carb Pizzas are packed with flavor, they are also ideal for the low carb dieter as well. At 4g of net carbs per serving, you really can’t beat it as a quick, tasty lunch option. CarLO CARBiano accomplishes this by way of packing its low carb pizzas with plenty of fiber to offset the carb count. It’s a perfect combination of taste and net carbs! Thanks for reading our article! 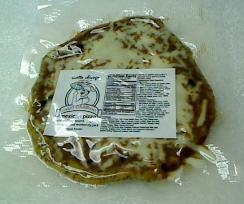 Did you know that Linda’s Diet Delites now carries CarLO CARBiano low carb pizzas? Take a look! Posted on December 4, 2011 May 9, 2013 Categories Food Finds, Low Carb DietTags CarLO CARBiano Low Carb PizzasLeave a comment on Easy To Make CarLO CARBiano Low Carb Pizzas — Perfect For Lunch!